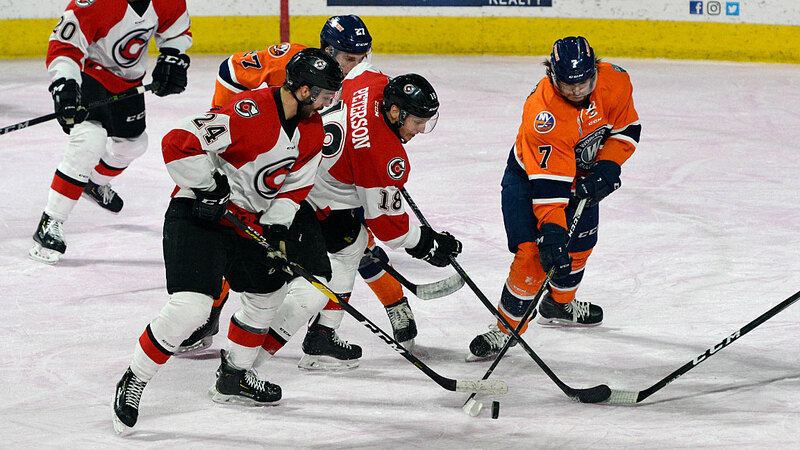 Worcester, MA – The Worcester Railers HC (21-20-4-3, 49pts)concluded a 3-in-3 home weekend with a 4-3 overtime loss to the visiting Cincinnati Cyclones (32-9-3-3, 70pts) in front of 4,602 fans at the DCU Center on Sunday afternoon.The Railers begin a season long seven game road trip with a 7pm puck drop in Portland vs. the Maine Mariners at 7pm. The Railers trailed 3-0 early in the second period before Ryan Hitchcock, Tyler Barnes, and Josh Holmstrom all scored for Worcester to force overtime. Evan Buitenhuis made 30 saves in net while Tyler Barnes set a Worcester pro hockey record with a goal in seven straight games as he netted his 20thof the season and extended his point streak to a franchise record nine games (9-3-12) in the overtime loss. Brady Vail won the game for the Cyclones at 2:39 of the extra frame while Jonas Johansson made 21 saves in net for the win. Cincinnati would score twice on their first two shots on goal in the first period as Vasili Glotov (9th) broke down the rightwing side and cut through the top of the crease at 1:54 and Myles Powell (19th) finished off an odd man rush at 5:27 to put Worcester down by two. Play was relatively even the rest of the period as the Railers outshot the Cyclones 7-5 through 20 minutes of play. The Cyclones went ahead 3-0 at 6:50 of the second period as Mitch Jones (3rd) got credited with a goal after the puck was fired to the front of the net from the right corner and banked off a body in front of the cage and into the cage. The Railers broke through at 15:39 after Bo Brauer caused a turnover in the offensive zone and Ryan Hitchcock (8th) skated through two defensemen from in tight and snapped a quick shot top shelf over the shoulder of goaltender Jonas Johansson. A ten- player scrum occurred after the final horn in the period as the Cyclones held a 20-16 shot advantage and a 3-1 lead through 40 minutes. Tyler Barnes (20th) drove to the net after a great give and go by Ryan Hitchcock and Ryan MacKinnon at 7:17 of the third period to give him a goal in a Worcester pro hockey record 7th straight game. Worcester would tie the score at 3-3 after a Tyler Mueller shot from the left wall deflected off Josh Holmstrom (11th) in front and trickled through the netminder and just over the goal line at 15:46 to force overtime. Shots were 11-8 in favor of Cincinnati in the third period. In overtime, the Railers killed off a power play chance before Brady Vail (17th) ripped a laser from 30 feet just inside the crossbar from the left side at 2:39 to give the Cyclones the 4-3 overtime road win. Notes: Three Stars: 3rd star: Josh Holmstrom (Goal) 2nd star: Ryan Hitchcock (Goal and Assist) 1st star: Brady Vail (OTG, Assist) …. final shots were 34-24 in favor of Cincinnati…. Jonas Johansson (16-5-3) made 21 saves on 24 shots for Cincinnati…. Evan Buitenhuis (7-8-4) made 30 saves on 34 shots for Worcester while Mitch Gillam was the backup…. Worcester went 0-for-4 on the power play while Cincinnati went 0-for-4…. Kyle McKenzie (inj), Woody Hudson, Tommy Kelley, Tommy Panico, and Malcolm Gould did not dress for Worcester…. Jeff Kubiak is on recall with the Bridgeport Sound Tigers…Alex Vanier was back in the lineup after missing the last two games due to an ECHL suspension…. defenseman Connor Doherty took a shot to the face midway through the second period and did not return to action after…..Tyler Barnes now has a franchise record nine-game point streak (9-3-12) and has set a Worcester pro hockey record with goals in seven straight games (Chris Kenady and Mathieu Darche)…Ryan Hitchcock now has 15 points (7-8-15) in his last 10 games for the Railers….Ryan MacKinnon, Mike Cornell, and Tyler Mueller also added assists for Worcester….the Railers are now 3-4 in overtime this season….14,814 fans attended the three games this weekend at the DCU Center. The Railers hit the road for a season long seven game road trip which begins on Wednesday, Feb 13 with a 7pm faceoff in Maine vs. the Mariners. Coverage begins at 6:35pm on 98.9 NASH Icon.